Whether you’re on a restricted diet due to fitness goals or because you’re pregnant, oftentimes it’s so much easier to invite people over to eat instead of going out and struggling over a menu to find something that either fits your calorie goals or macros, or something that doesn’t make you want to shriek “WHY DO I LOVE EVERYTHING PREGNANT WOMEN AREN’T SUPPOSED TO EAT” – or worse, something that doesn’t make you want to hurl (I’m looking at you, white meat chicken and fully-cooked eggs!). It helps if you have some basic kitchen know-how, but here is a menu I served recently when the lovely Matt & Kym offered to come visit us with their 18 month old instead of trying to find a place to accommodate all our various needs. I think it went over pretty well – the dishes are not particularly adventurous, and there was something for everyone, and we were all satisfied in the end. For any brunch there must be beverages! Hubba Hubby is a skilled home mixologist with a well-stocked bar; normally when we host, I’d ask him to batch a cocktail. However, given that this was brunch and we only had 2 other adults joining us – and a total of 3 adults who might drink – I kept it simple and pulled out a bottle of sparkling wine to put next to the pitcher of OJ (Tropicana; who’s got time to fresh-squeeze OJ? besides, pregnant ladies aren’t supposed to drink non-pasteurized juices) for make-your-own-mimosas. We have a Keurig for hot coffee, and we always have a 2 gallon dispenser of (home) cold brew on hand, so we were pretty set for drinks. Some sugar cubes in a ramekin, a small container of half & half, and we’re good to go on beverages. 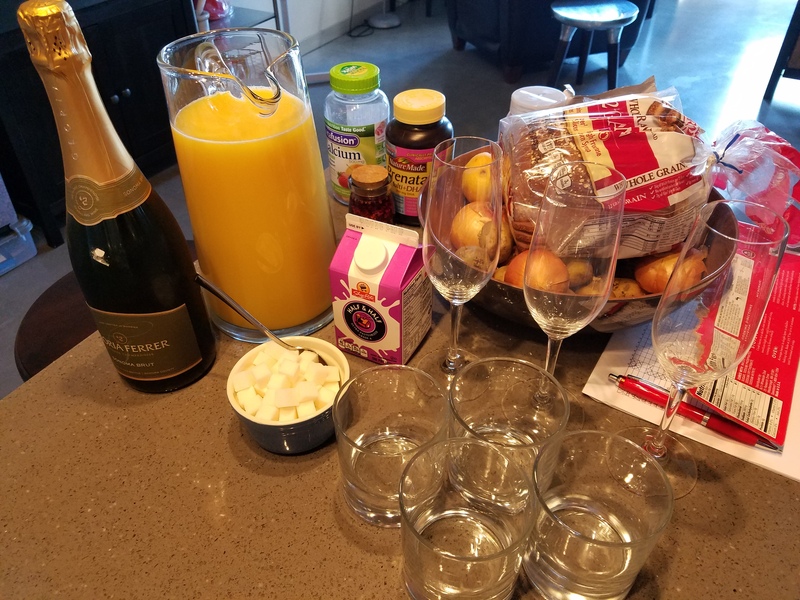 **Huge shout out to Hubba Hubby – after a few hours of gabbing and chatting, he pulled out his cocktail stuff and whipped up a few different drinks for our friends. I don’t remember the first one — but the second one was definitely this Clover Club, which tickled everyone’s fancy. 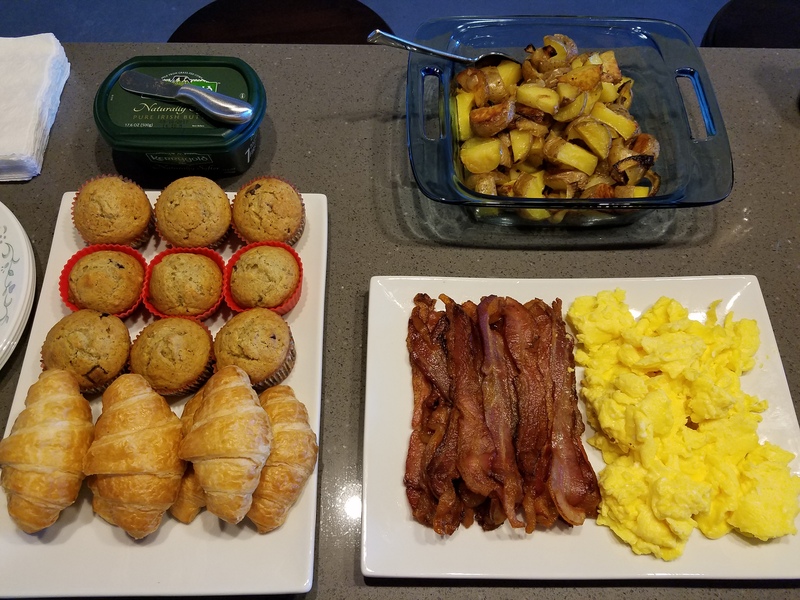 And now the food – so simple – banana chocolate chunk muffins; mini croissants from BJ’s; Kerrygold butter; olive oil gold potatoes; thick-cut bacon; scrambled eggs. Honestly, I’m not sure it gets easier than this. The muffins were from a Krusteaz mix, a pack of 3 for $2.99 at BJ’s (we are so lucky to live so close to a BJ’s wholesale club; if we had to drive any farther, I don’t know that we’d be members). You add egg and water and that’s it — seriously. The banana flavor is pretty muted, the chocolate chunks probably aren’t very “healthy” but they make a quick bite in the morning that fuels a lot of my early workouts. 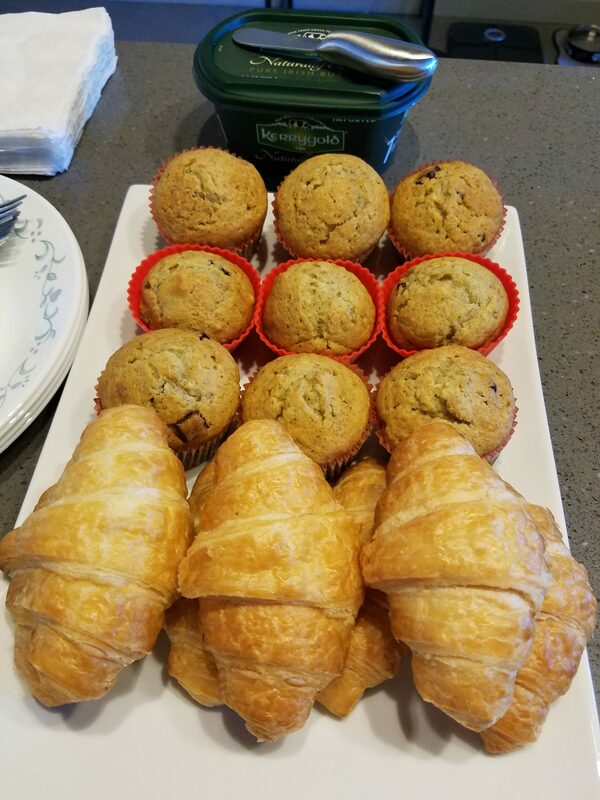 The mini croissants were just picked up in the box and put out. If I were more certain more would have been eaten, I’d have popped them in a cloth napkin and then warmed them through in the oven — but not knowing what the turnover would be, I kept them as-is. No complaints. 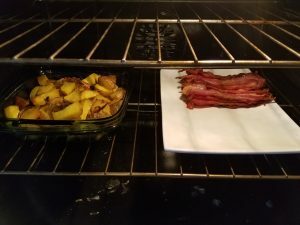 Bacon — since I was cooking the whole pack of bacon, I laid them out a baking sheet and cooked them in the oven. This left me free to do other things in the meanwhile and I wasn’t chained to the stove during that time. Most packaged bacon will have instructions for oven-cooking, I followed these mostly and also looked at them to determine doneness. For the potatoes — super simple, I diced up gold potatoes and two small onions, tossed it all with olive oil and a little salt, spread into one layer on a sheet pan and roasted them at 375 degrees for 40ish minutes, checking them every once in a while and shaking the sheet pan a little bit. You can line it with foil for easier clean up. Then I just scooped them into a serving dish (well, a casserole dish) and put them in a 200 degree oven to stay warm while I finished prepping – along with the bacon on a serving dish. Easy-peasy. My scrambled eggs “recipe” isn’t a recipe — but I’m in the camp that makes them with salt, no pepper, and a generous ‘splash’ of milk or cream. I beat them by hand until they’re very frothy, and cook them in butter over med-high heat, running my spatula across the bottom as curds form. These I took off the heat after I could fold them but they were still a touch wet/moist in the center — mostly because I knew the residual heat would continue cooking them, and because they were going into the oven to be kept warm as well. With the potatoes, bacon and eggs set up on platters in the oven staying warm, I just wiped down the countertops, wiped out the skillet, and waited for the bell to ring. Super simple, right? 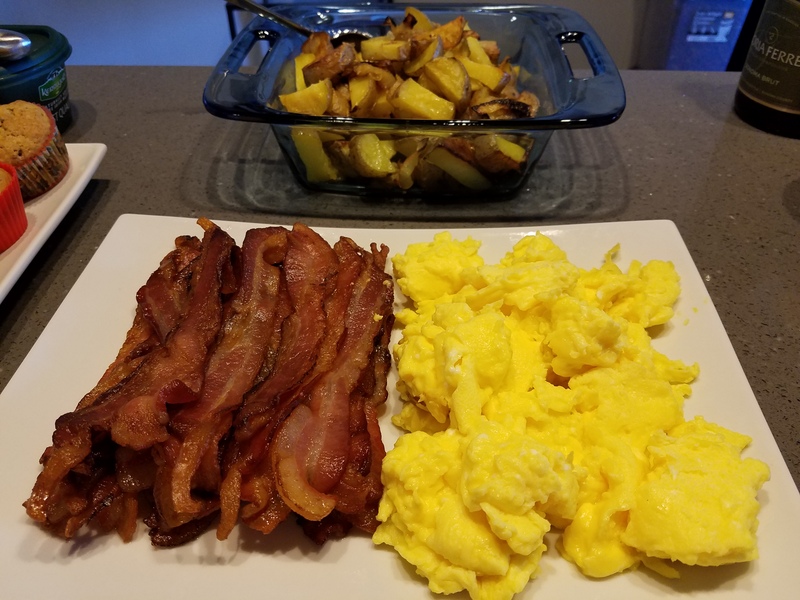 And when it came time to eat — I was able to serve myself a reasonable portion size, opt out of the eggs (minus a tiny taste just to make sure they were OK), have some potatoes, bacon and a muffin, and not feel bad about my choices — and I don’t think anyone noticed what I did or didn’t eat. Hubba Hubby avoided the foods he didn’t like or want to eat, as did the others, but no one commented and everyone was super happy. Sticking to your fitness goals/dietary needs/personal preferences isn’t too difficult with a little advance planning and understanding friends. While going out is surely fun (and you know I do love going out to eat! ), sometimes it’s nice to entertain and have people come over for a low cost, low stress hang out. Also, we love board games… so I may eventually post about what I serve during board game nights!! How do you manage to keep your fitness goals, calorie goals, budget in check while still having an active social life? Share your tips in comments – I’d love to hear from you!! So a few things that really help me: when I go out to eat I try to look at the menu first and visualize what I’m going to want to eat. I also try not to go out STARVING because that’s no good. I do the same thing at parties/dinners, scope out what’s available and strategize what I want the most. Since I was diagnosed with Type 1 Diabetes this has been imperative to maintaining tight control on my blood sugar.